Since its discovery, DNA has been proven to be an invaluable molecule in the field of biology. The molecule contains the information for life and holds in it our very essence. Despite DNA’s importance to life and science, easy manipulation of this molecule has proven to be very challenging. That’s why many have considered the discovery of the CRISPR/Cas9 system, which can add or remove parts of a DNA sequence with a high degree of specificity, to be a revolutionary new technology that has limitless potential. The CRISPR-Cas9 system consists of two key molecules that work together to produce the change in DNA . One molecule is an enzyme called Cas9 which cuts the DNA at a specific site where the addition or deletion will occur . The other molecule is called a guide RNA (gRNA) which binds to the DNA’s specific site and ‘guides’ Cas9 to the right part of the genome . Together, these molecules ensure that the DNA will be modified at the proper location. 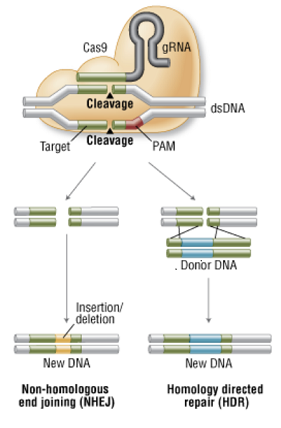 If the deletion of a gene is desired, we can then cleave the DNA at two sites--one at each end of the gene . The two resulting strands of DNA (excluding the gene) will then recombine, forming a DNA sequence without the gene . If the addition of a gene is desired, a donor strand of DNA with the desired insertion can be introduced in the system . The previously cleaved DNA will each bind to one side of the insertion and then fuse to become one single DNA molecule again . So why is any of this important? Many diseases, such as cancer, cystic fibrosis, and anemia, are the result of faulty mutations in DNA that create dysfunctional proteins . Now imagine if we could simply change the mutated DNA back to its unmutated form. This is essentially what the CRISPR/Cas9 system allows us to do, which explains why so many people view the tool as the future of medicine. This potential has driven the start of several CRISPR/Cas9 trials in China for various types of cancer . Due to stricter regulation, the US has not seen any trials yet, though the University of Pennsylvania had expressed its intention in 2017 to begin trials to treat melanomas and sarcomas . Similarly, Stanford scientists and clinicians are trying to start a clinical trial aimed at curing sickle cell anemia through CRISPR/Cas9 . Clearly, CRISPR/Cas9 holds great promise for the future of medicine. However, with great power comes great responsibility: the ability to easily edit DNA generates a great deal of ethical questions . Much of this ethical debate stems around the potential use of gene editing on germline (reproductive) cells and the potential creation of designer babies . How would society accommodate the development of such individuals and how would socioeconomic status come into play? These are all serious questions that must be considered and answered eventually, but for now let’s marvel on how far science has come.